She Can Run! And sweat, evidently. After completing my first pain-free 5km run, I was tempted to get straight back on the treadmill the next day and do it again. It was just so fun and exciting to be able to run comfortably. Instead, I celebrated with a beer and rested my knees for a few days, switching my training to swimming for the next mornings. The plan was to give myself the best possible chance of enjoying the same running experience all over again, because even though I had felt no pain during the successful run, I woke up the next day with slightly creaky hips – probably as a gentle reminder that I hadn’t run anywhere for 7 years and couldn’t expect to suddenly run everywhere. And if I’m honest, a small part of me deep down was convinced that the whole thing had to be a fluke – so dragging out the rest period for as long as possible allowed me to enjoy the pretense that I could now run without pain. By the time I eventually got ready to head back to the gym and get on the treadmill, I had butterflies and nerves like I was about to do a race. It was so bad that I made a mental note that I am going to be an absolute wreck on the actual race days – please accept this as your official warning that I should not be approached in the hours preceding a triathlon. Avoid the use of flashing lights or loud noises. And if in doubt, apply beer liberally. So I did my warm up and got onto the treadmill, setting the pace at 10kph which is probably as fast as I would hope for in a triathlon after doing the swim and bike, so not a bad pace to train at. I quickly slipped into the careful form I had adopted last time, but I made a concerted effort to relax my shoulders a little and try not to give myself a headache. Miraculously, after 10 minutes I had no pain! But I realised I had been staring continuously at the ‘Stop’ button and chanting the words ‘stop’ and ‘pots’ to myself on every stride, which probably wasn’t ideal for my mental focus. So I tried to look away. At the 15 minutes mark, I realised my gaze was now firmly fixed on the ‘Emergency Stop’ button. Not a great improvement. Again, I tried to find something else to look at. 20 minutes in, the best I had managed was shifting my eyes over to look at the ‘Start’ button, which for some reason was demotivating me more than the stop buttons. I wished I could tilt my head and body back a bit to look up at the TV screens on the wall, but I couldn’t risk altering my form. I will need to find a way to get my tablet or something to look at on the little display area of the treadmill, because by the time I reached my 5km mark I was bored. I was happy, pain-free and a successful runner, but bored. Maybe after a few more runs I can switch it up to incorporate some runs outside, which will be much more interesting. But the treadmill has been more convenient for keeping an eye on my form and ensuring I can stick to my rules of stopping immediately if the pain kicks in. A few days later I did another 5km run on the treadmill, and this morning I did a 6km run. On Thursday night I hope to do another 6km run and next week I’ll aim for 7km. I am officially able to run! 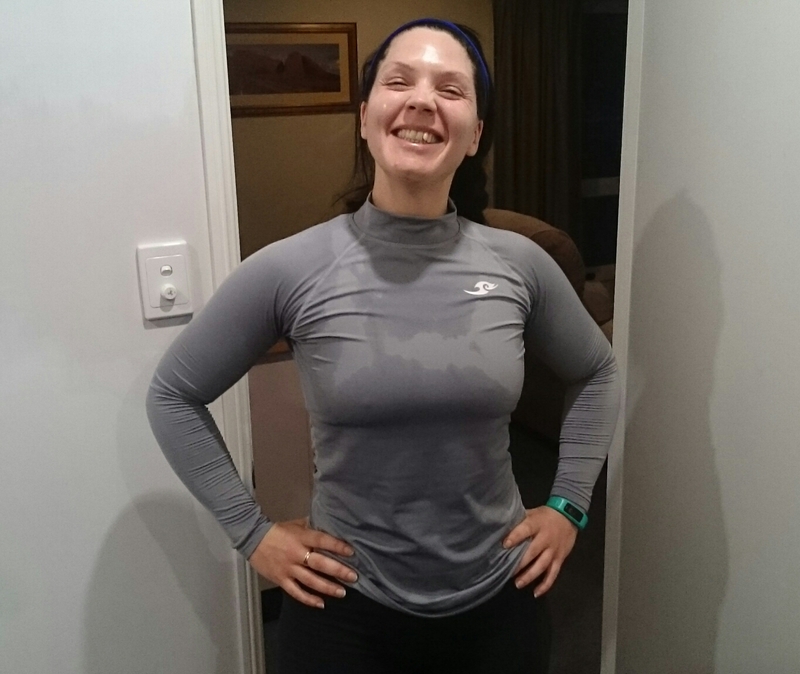 This entry was posted in Show Me Run and tagged beer, bribie, insoles, knee pain, newbie, orthotics, pain, running, training, triathlon. Bookmark the permalink. Yes I think I will be adding headphones to my shopping list (can you believe I don’t own any? I live in the 18th century apparently) They do play music at the gym of course, but it goes through me rather than motivates me. An audio book sounds like a great idea! And perhaps if I chose the music myself I would enjoy music too.